It can sometimes be hard to see what you are doing wrong in your lifestyle because, well, it’s your lifestyle. Your daily routine is so well known to you that it can become second nature to read before bed, look on your tablet or go for that game of golf on a Friday night. What if I told you that all of these could be making your shoulder pain worse? That all these movements cause unnecessary strain on your shoulders, leaving you in pain the next day? First things first, when you wake up don’t forget to stretch. I know this is something I say often, but because it’s ‘just’ a stretch, the power of stretching can often be underestimated. Imagine this, someone has been in the same position for roughly 8 hours, without much movement. Do you think they would need to stretch afterwards? You may have woken up but your joints haven’t yet. It’s like going for a run without warming up. So with this in mind, stretch before you get up. Even if it’s just for a few minutes, it’s better than nothing. Looking at your phone or tablet has to be one of the worst culprits for shoulder pain. Yes, looking at your phone or tablet can have an effect on your neck as well, but the pain often starts at the neck and spreads to your shoulders. I understand you may need to check emails on your tablet, or take lots of calls, but with many of us spending hours on our devices, it interrupts our body’s natural state. Since your head is facing down using these devices, it can result in poor posture and slouching. What most people don’t know is that your head is supposed to be in a position were your ears are in line with your shoulders. As soon as you start looking down, your body is more likely to feel a strain in the neck and shoulders. My advice on this would be to limit the use of your phone to about 10 minutes a time to avoid strain. You can of course use headphones which is much better for you too. As for other devices, you can buy specially designed cases for them that that allows you to stand your device so it’s hands-free. Perfect! My tip here would be to take advantage of the stand and use it, so that your eyes do the adjusting, not your head! This also goes for reading at night too. I understand that reading at night is sometimes a habit picked up as a child, which is a great habit to pick up. For your body however, it can sometimes have a negative effect on your posture. Another problem that can come from reading on a night is actually from holding the book. It’s not something you really think about but holding a book cause particular muscles to be tensed. Not only this but your neck is also likely to be tensed to keep you upright whilst reading. Now think of how long you read for. How many times do you say, ‘just one more chapter’ before you finally drift off? I really love this habit so I would recommend to continue reading but to only sit in the same position for up to 20 minutes. Another great way of thinking about your shoulder pain throughout the day is to think about when it occurs. Is it when you tend to carry the shopping, when you sit at work or whilst you exercise? If you have an idea when it occurs, then focus on making sure your head is straight and your ears are in line with your shoulders. This is the best tip I know and if you apply it as much of your daily routine as possible, you will start to feel a difference. And lastly, alleviate niggling problems with your shoulders by avoiding heavy shoulder bags. A cross-body bag is much better at helping to alleviate strain on your body, but always try and keep your bags as light as possible. If it’s unavoidable, use rucksack-type bags where you equally distribute weight across both of your shoulders, rather than slinging your bag over one shoulder. 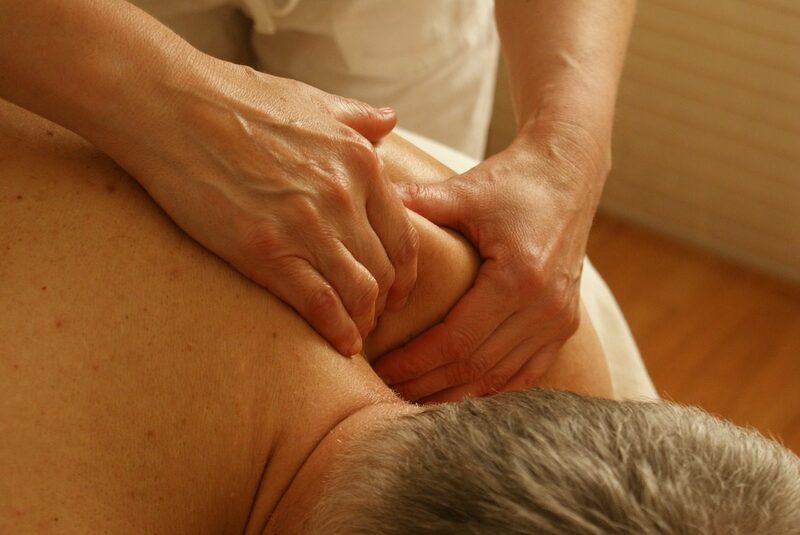 If you’d like more specific help with easing shoulder pain, you can always speak to one of our Physiotherapists HERE.